I ran through the bush. I ran till I felt my heart burst inside my chest. And I ran some more. My torn wrapper felt wet beneath the white shirt. Branches – canes and flogging sticks not yet plucked from the mangrove saplings – left bright wheals on my face and my arms, slapping me as I ran away from him. My blood formed a dark stain that spread from between my legs, through the wrapper and unto the outside of the shirt. This shirt, a gift from my new husband. My prince, Rafayel. The one you chose for me, Papa. Pietro called after me as he pursued me through the soggy footholds of our swamps. He told me to stop; that he meant no harm; that he loved me and that everything would be alright. Why had I been so foolish? When Pietro met me at the farm, why had I followed him? Why had I believed Rafayel had sent for me? Why had I believed anything Pietro said? When Pietro smiled at me with his brown broken teeth dancing around his tongue, like restless bats in the afternoon, why did I not remember the last time, the many times, I had seen him smile that smile? That smile of teeth stained brown by the smoke from the death-leaf that Rafayel told me his people burn and inhale. That smile that always left my stomach feeling like the devil had defecated in it. Run, princess, run. He will not catch you. You are of the Ijaw. You are the daughter of warriors. Pietro attacked me. I followed him away from the path to where he said my Rafayel waited for me. Where he said his white hairy smelly brothers needed more of my medicine for the green fever that ate away at their faces; the green fever that left solid masses in their sides. And I believed him. And he raped me. Ah, but I fought him. I bit. I scratched. And then I ran. The village was not far. My father’s hamlet was not far. It was early evening yet, the full moon still fighting from behind pregnant clouds for supremacy with the red, dimming sun. I would meet the men gathered around the Amananaowei’s hut; your house, Papa, huddled and arguing loudly in the inner glow of gin-filled happiness about how to share the latest trinkets from the strangers from across the sea. Trinkets and shiny things exchanged for slaves from deeper in the bush; exchanged for nuts from the father of all trees, the palm. Yes, I would make it home. I would escape the snapping branches and the loud curses from this pale animal behind me. I would tell you what had happened. I would say what this friend of your friend had done to your daughter. I would smile when you swung your cutlass and lopped his head off. There was just the river to cross. Just the stream by whose bank my canoe lay. But my canoe was not at the spot I had left it. I screamed. For help, for someone, for you, Papa, for Rafayel, for my brother, Dienye. But the only ones who answered back were frogs and owls and bush-babies. Pietro caught me halfway across the creek. Why the screaming, Papa? Why do the women wail? I have not even told of everything? Turn away from the river and look at me, Papa. I remember Pietro’s hands on my head pushing me into the water, deeper and deeper. I begged him. I shouted, “Please, don’t do this.” I remembered to say these words in the little I knew of his language, Portuguese. I held my breath. I tasted the mud of the creeks. My wrapper loosened, my breasts now brushing against the white shiny shirt Rafayel gave me as a gift. The shirt now brown with water stained by the stilted roots of the mangrove. Fight him. Pull him in too. But why am I so weak. “Please die,” he said. Through quivering lips the urgent pleading for me to depart this life. Through the miasma of dancing images – the water above my eyes, the lilies, my hair, strands stretched out by the hot comb and carried in eddies, and the mud-speckled waves of my floating white shirt – I saw his eyes. I thought I saw them smile. Can you not hear me? What is this you drag out of the water? Another suicide? Is that why the women cry? Is this why you tear at your clothes, Papa? Where is Rafayel, Papa? Pietro’s teeth were the last things I remember. And then the knives. A thousand blades of hot steel slammed into the back of my head as the water entered me and then I sank. Falling away from Pietro’s Hands, falling away from the floating roots of the hyacinth and the lilies. Then nothing. I sank in darkness, seeing nothing, hearing only the rush of whispers as the water beat against the river bank, transmitted to me in waves. Shafts of straight silver. The moon had risen. Like stripes from a horsewhip, they contorted me, arching my back, piercing pain and glorious pleasure. And I rose, not looking down, hypnotized in wonder by the moon-play on the underside of the river’s surface. I heard voices? Indistinct, Papa, but who could mistake your voice? I came to you. I saw you with the men gathered not around your hut but at the river bank. I saw my canoe at your feet. I saw the question in your eyes. And I heard you call, I heard you all call. I heard you call, Papa. Why do you not hear me? The body you and Dienye pull out of the water distracts you. Why does Dienye cry? Who is the bloated, naked person wearing the stained-brown cloth of the foreigners? Papa, I notice something new. Are you listening, Papa? I can swim without moving. I am waist-high in the water. My arms, slick like the oil from palm nuts, do not do any work, yet I swim. Below the surface I see nothing but the reflection of my naked breasts, and my hair, damp and strangely straight like that of the woman whose image hangs on the wall of the big room in Rafayel’s iron war-canoe. It is as though I end where the water begins. Rafayel comes. Rafayel, thank the gods you are safe! Papa does not hear me. I come to tell you of your captain, your Pietro; of what he has stolen from me. My honour, Rafayel, my honour. Look, Rafayel, Pietro is behind you. See how he tries to hide his right hand. I choked on the chunk of flesh I bit off him. Is this me? Still wearing the foreigner’s shirt and cradled in the roots of the mangrove surrounded by my brother; my father, the Amananaowei; and my lover, the father of my unborn child, Rafayel? Did I die by Pietro’s hand; did I drown in the deep? I see my white husband, tears in his eyes; I see him push my father and brother away. I see Rafayel take my face in his hands. Those hands. I see him breath into my lips, but I cannot feel him from here in the water. I rush at them all, stopping when I notice I have passed them already, drifted through them, no substance. No, it cannot be. That is not true. That is not true. I see my father look at the white foreign dogs with new eyes, trusting eyes. I see that he has new sons already, to replace the daughter he has just lost. The daughter he lost when he handed me as a gift to the leader of the visitors from across the sea. There will be no Igbadai for me, no inquiry into the cause of this tragedy. I am lost. I drift with it. What is time to my kind but the now, the present? My kind. I am joined by others. Floating spirits, some green-eyed, blazing little pots of fire behind half-closed eyelids, seductresses; others pale, tall giantesses with golden hair and golden-scaled fish tails below the waist; and the dark and lithe phantoms like me and with straightened hair like mine. They tell me stories, these women, these spectres, these undead. They tell me of the names the living call us, us wronged women. 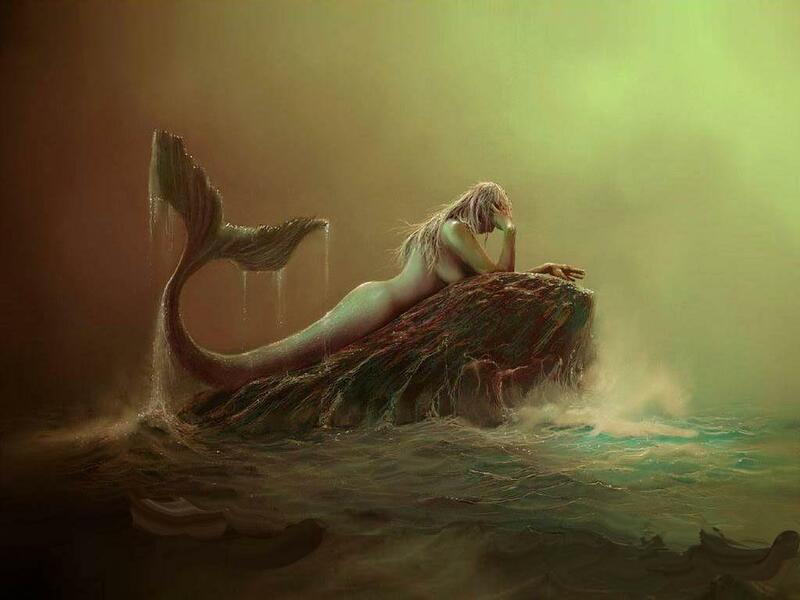 They tell me of the Rusalka of the cold north; the fish-women of Rafayel’s land; the Yemoja, goddesses of the slaves that my people sell; the Jengu from across the mountains to the east, progeny of Mojele and Moto. My sisters, my Onwuamapu, tell me of what we are meant to do. Stories of young lost men drawn into our embrace and our kisses. Stories of cold revenge and liquid fulfilment under moonlit nights. I do not want this existence so I drift, forever. Weeks, years, decades, an age I spend on the shoreline singing my song. And I am worshipped with sacrifices and masqueraded festivals in the weeks before the full moon. Sacrifices given before the time when the silver shafts fill my veins with glorious light; when the children, receptive all, tell tales of me and my sisters. When the sensitive claim that they hear my songs. I see my people farm on dark putrid brown loam. I see the men fish. I see some of the new breed, offspring of Rafayel and his ilk. Like my unborn child would have been. My people stand on the riverbank, a wonder-filled mixture of skin hues. Strange ashen men in white gowns, with bars of wood crossed topsy-turvy, chant inanities in my water; they bathe my people in short episodes, still speaking in their strange dead tongue. My people adopt a corruption of this high tongue. And soon I am given a new name. Mammy-Water. They start to forget me. Rafayel, I see him alone, breathing fire and smoke from a thin reed that he kisses. How long has it been? Under the full moon he is still dark, still pale, still handsome, and still horrid. I am drawn to him. He sits alone on top of one of the platforms that the new stilts suspend, forlorn, his foot treading the water. I ignore the loud drums and strings and horns I hear from elsewhere, from where the rest of his people rejoice in revelry. I rise up with the water and he sees me. No not Rafayel, he says, when I call his name. No, not Rafayel. Not Pietro either. This one is paler, thicker, and with golden, almost white, hair. His eyes fascinate me, grey like the northern tribe of sisters, the Rusalka. Grey and sad. He speaks like a frog and lacks the syrupy skill of Rafayel’s tongue. “You,” I say. I sing my song. He is enthralled and reaches out to me, pulling me out of the water. His touch gives substance to my incorporeal nightmare, my fingertips form in contact with his, an effect like the moon-rise. My long wavy hair, my breasts, my heat. He wants me, this lovelorn white boy; homesick for one he calls Inga. And I kiss him. Desire is a fever in me. I do not want him dead. No, my sisters. No soul for a soul. I want some of his heat, his essence that I see pulsing within him. He gasps and I feel it leeching into me. I laugh, trashing his face with my hair. I cannot stop, my eyes closed, my long hair caressing his shoulders as I slip down with him unto the cold metal floor. I turn to go but he grasps my hand. I look at him now. He is grey, now. His lips a shadow of white still wet with my water. “Who are you?” he asks. Tell them Mammy-Water. Tell them Yemoja. Tell them LaSiren. *Eghosa Imasuen was born on 19 May 1976, and grew up in Warri. He is a medical doctor, bank executive, husband of Eniye Osawe-Imasuen and father of twin boys. 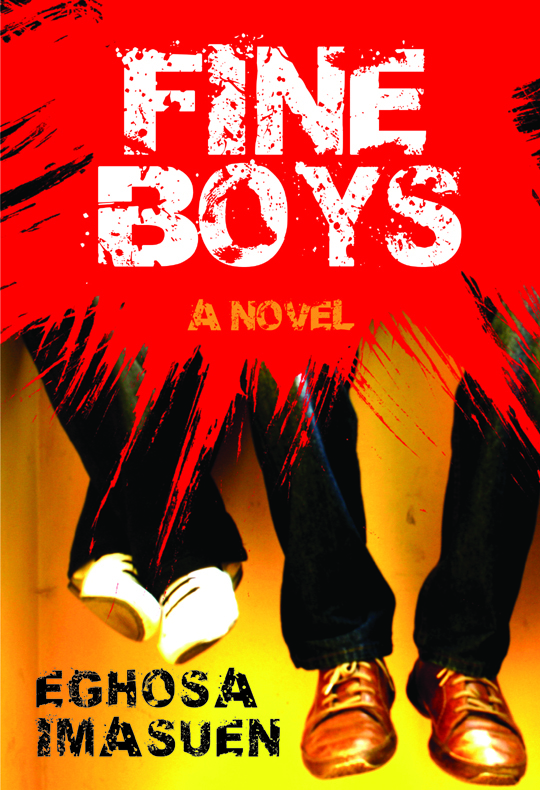 Fine Boys is available for purchase from the iBookstore, Kindle US, Kindle UK (Nigerians can purchase here), Smashwords, Kachifo (via orders@kachifo.com and 08077364217, or visit our store at 253 Herbert Macaulay Way, Alagomeji, Yaba) and all major bookstores. 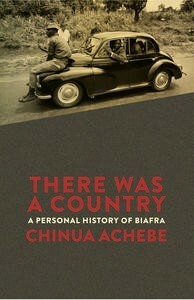 “I met Chinua Achebe for the first time when I was in high school, but I knew him through his works long before that. “Uncle,” as my siblings and I were told to call him, came to our house in Washington, D.C., for a tea time reception my mother had organized. She had just co-written a biography of him for children, inspired in part by my lament that there were few books about the lives of famous Africans.” Uzodinma Iweala. My mother wrote nothing on Achebe, she hasn’t read Things Fall Apart, but she paid for my copy. I was reading the Financial Times and I saw a 1968 picture of Biafran soldiers standing on a tugboat. I gazed and noticed it was a portrait of an armed soldier sitting on a concrete platform, he wore no uniform and his face was very easily identifiable. In the background, men in mufti, about thirty of them, posed on two tugboats on the river, only two guns were visible. I took away the memory of that picture from William Wallis’s review of Chinua Achebe’s memoir in the FT. I wondered if the armed and unnamed soldier died during that conflict or if he survived the war, and if his heirs were alive. In Nigeria, it has become an intellectual fad to write a review of Achebe’s Biafran memoir; even by people who haven’t actually read the book. I promise not to write one. I have read too many. But I have gathered some interesting reviews of Achebe’s book and I have quoted them for your reading pleasure. “There is an eclectic range of insights and fascinating anecdotes buried in there, but this is not a book that will add much to the understanding of the war, nor one that will go down among Achebe’s great works.” William Wallis. “But many have waited and hoped for a memoir, for his personal take on a contested history. Now at last he has written it. Although it is subtitled ‘A Personal History of Biafra’, There Was A Country is striking for not being very personal in its account of the war. Instead it is a Nigerian nationalist lament for the failure of the giant that never was; Achebe is mourning Nigeria’s failures, the greatest and most devastating of which was Biafra.” Chimamanda Ngozi Adichie. I read Noo Saro Wiwa’s review in The Guardian. Her father wrote On the Darkling Plain, a Niger Delta narrative of the Nigerian Civil War. Tolu Ogunlesi wrote an acclaimed review of Achebe’s memoir. Yes, some reviews were acclaimed. Ike Anya also wrote for African Arguments. Chika Unigwe wrote for The New Statesman. In summary, I hope you agree, whatever your misgivings about the book, that there indeed, was a country. You can buy copies of There Was a Country by Chinua Achebe from Farafina Books by sending an email to orders@kachifo.com, visit our store at 253 Herbert Macaulay Way, Alagomeji Yaba or call us on 08077364217. The Sillerman First Book Prize for African Poets is part of the recently established African Poetry Book Fund and Series. The winner of this prize will receive USD $1000 and publication through the University of Nebraska Press and Amalion Press in Senegal. Please note that there is no submission fee and entry closes on the 15th of November 2012. For useful information about the prize, such as when to send a manuscript, eligibility, judging, and how to submit to the prize, click here.